Athens, GA (Sept 8, 2008) - Fans in the University of Georgia Bulldog Nation are up in arms! ESPN did not show "The Hurdle" on any of their news shows Saturday night and into Sunday. But their ire is probably misdirected. What? You did not hear about "The Hurdle"? Heisman candidate Knowshon Moreno racked up 168 yards rushing, 30 yards receiving, and 3 touchdowns in a 56-17 victory over Central Michigan University on Saturday. Knowshon Moreno is becoming a human highlight reel. Photograph Courtesy of UGA Sports Communications. 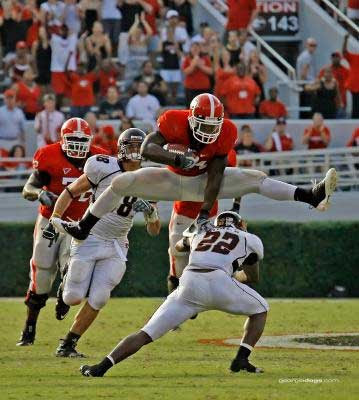 But the play that will be remembered by most of the 92,000 people in Sanford Stadium and those watching on FSN South will be "The Hurdle", which came during a 29-yard run by Moreno. A Central Michigan player committed him self to tackle Moreno low, and Moreno simply said no problem. He jumped four feet in the air to hurdle over the player. So why did ESPN not show the highlight and why did it not make the top ten plays of the week? According to Brett Jensen of totaluga.com, the answer is quite simple. In order to show the highlight, you have to have the highlight. In an interview on 960theref this morning, he said that his contacts at ESPN told him that the highlight was not sent as part of the highlights package by FSN South. Why that was excluded from the melt is open to conjecture, but if this is the case, ESPN is not the villain. I know, I know, you want to see "The Hurdle" now. It is our policy to avoid posting any material which is copyrighted on this site without permission, and we do not have the permission of the Southeastern Conference or FSN South to show the video. But you can see it over on YouTube and it is definitely worth watching!